When recommending cars to other people, it’s easy to fall into a pattern and suggest the same old BMWs, Hondas, and Toyotas. The problem with those picks is they tend to carry higher prices due to their popularity. Sometimes the key to finding great values is to look for cars that others forget. I’m lucky enough to have a job where I get paid to tell people what car to buy. Granted, people don’t always take my advice, but they do give me an opportunity to make my case. For pre-owned customers, I often end up suggesting something that wasn’t all that popular when new, but can be a great bargain on the used market. Here are six cars under $15,000, that get lost in the crowd but are worth finding. Infiniti EX35 - This one goes out to my fellow longroof-loving friends who complain there aren’t enough wagons. What if I told you there is a luxury wagon with better reliability than the Europeans, a V6 motor with almost 300 horsepower, and is available in rear or all-wheel-drive? The best part is you can have all this with reasonable miles for under $14000. The Infiniti EX 35 is basically a lifted wagon version of the old G35 sedan, a car that gave the BMW 3-series a run for its money. The EX is blessed with Nissan/Infiniti’s practically bulletproof VQ series V6 that makes about 285 HP. Spend a little more on a later E37 model and you can have over 300 HP. It’s not going to have the sleek looks of an E91 BMW or Audi Avant, but you won’t stress about running costs when it crests over 100,000 miles. Chevy Impala - When people want an affordable sedan two key features often come up, comfortable and reliable. Sure, you could go for the easy answer of a Honda Accord or Toyota Camry. But the problem is once you get into the $10,000 and under range, you’re looking at mostly high mileage examples for the imports. The Impala may not be fancy, but what it lacks in flash it more than makes up for in durability. These cars have been used for police and taxi duty and can stand up to a lot of abuse. Chevy cranked out a ton of them so inventory is plentiful. Many of the examples will have been former rentals, which will scare some buyers away, but there are several available with one or two owners and well under 50,000 miles for around $8,000. I recommend you dig deep and find one with a police package. Mazda5- We have already established that cool parents buy minivans instead of crossovers, and if you are a really cool parent and you don’t need a living room on wheels, you can grab a van with a JDM vibe. A 2015 model with a warranty balance very low miles can for around $14,000. Unfortunately, Mazda discontinued the 5 in the U.S. due to low sales figures, but that doesn’t mean it won’t make for a great van for you and your family. The smaller size means it seats six instead of seven, and the four-cylinder motor won’t win any drag races. But the well-tuned chassis is everything you would expect from Mazda which means the 5 can handle turns confidently, and if you really look hard you can find a van with a manual gearbox. Kia Forte- The nice thing about modern “cheap” cars is you don’t have to feel like you bought a penalty box if you spend less than $15,000. The compact sedan class is crowded with some high-quality cars like the Corolla, Civic and Mazda3, so it’s easy to see why people would forget about the Kia Forte. The Forte shares a platform and components with the Hyundai Elantra, and while it has a starting MSRP of $17,460, savvy shoppers can possibly pick one up brand new one, complete with the 100,000 mile powertrain warranty for under $15,000. Of course, this means navigating the buying process with a Kia dealer and many of these advertised prices are stacked with rebates that not buyers would qualify for so it’s important to be on top of your game if you are shopping for a Kia. Nissan Frontier - Who doesn’t love a cheap pickup truck? I’m not talking about one of these full-size, monster V8, pseudo-luxury trucks—just something small and simple just to get stuff done. Sure, you could get a Tacoma, and they are wonderful trucks, but good luck finding one for a reasonable price with less than a billion miles on it. If Toyota’s bonkers resale value has you down, have a look at Nissan. The Frontier may not have the same reputation for indestructibility as the Taco, but well cared for examples can rack up the miles with little drama. The best part is you can land a nice, 4WD example for around $10,000. Suzuki SX4- Suzuki makes some great motorcycles, but couldn’t quite cut it as an automotive brand in the U.S. market. Which is too bad, because they had some gems that were affordable, reliable, and fun to drive. Sometimes you need a cheap daily driver than can handle the snow or a solid winter beater. 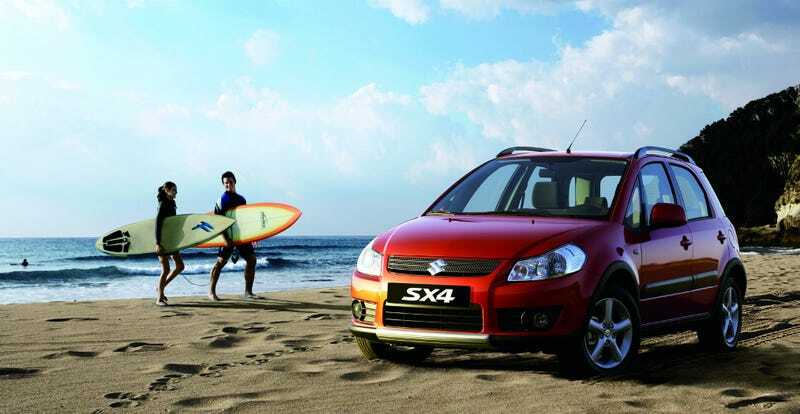 Check out the SX4. You can nab a Touring model with Navigation (okay, it’s just a pop-up Tom-Tom unit, but still!) with less than 26,000 miles. If you are going to go the plucky Suzuki route, do yourself a favor and get one with a manual. Even if you don’t know how to drive stick, this would make a great car to learn on. Getting an affordable ride doesn’t mean having to buy a brand new econobox or rolling the dice on luxury car maintenance. Think outside the box and get a unique ride that you will really enjoy.